Many See Strange Craft Pass Over Chattanooga. 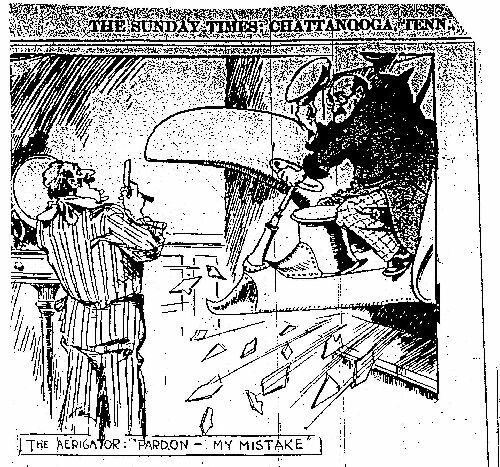 Wonder If Aviator Has Sinister Designs Upon Chattanooga Territory. KNOXVILLE, Tenn., Jan. 14 - Several citizens report having seen a dirigible airship which passed over the city shortly before 7 o'clock tonight ___ in a southerly direction. The outline of the air craft could plainly be seen and the noise of the motors could be heard. Fast speed was being made on its trip across the city occupied __ few minutes time. The machine was under perfect control. The squire and a very few others who must have been "on" have had lots of un. The gullibles whose name is legion, may have enjoyed the stunt, too, but just how much they will appreciate the humor of the situation now remaineth to be seen. It will depend largely on the temperament of the victim. A joke's a joke, but when the victim gets wise the effect is more or less doubtful. Doubtless the joking 'squire's ears will burn with an exceeding warmth today, because of the many he so thoroughly fooled there will be some to express themselves plainly, forgetting the Sunday school lesson yesterday. I am spending my time collecting data that indicate that there are other, inhabited worlds, perhaps not the visible planets; not inaccessibly remote; and that explorers from them have many times been seen in the sky. In the newspapers, this work has been called "epoch-making," also otherwise, according to various opinions and emotions - "rather crazy," for instance. Of many accounts of seeming explorers from other worlds, in the sky of this earth, I pick out one that is not especial for its convincingness, but that is convenient as to date, because the occurence was at a time when dirigible airships of this earth could not have sailed even from St. Cyr to Paris. In the Journal des Debats (Paris) April 12, 1905, is reported a luminous object, or an object bearing lights, which had been appearing every night since April 1, over the city of Cherbourg, France. In the "Bull Soc. Astro. de France," 19-243, Flammarion says that the object must have been the planet Venus; he therefore derides the descriptions of it as having sometimes moved in various directions, saying that such supposed observations were illusions. In Le Figaro, April 13, it is said that the prefet maritime, of Cherbourg, had commisioned Commander de Kerillis, of the "Chasseloup-Laubat," to investigate. The results of this officer's investigations are published; that the object was not in the position of the planet Venus, and that it did not have the cresentic disk of Venus. COLUMBUS GROVE, O., June 18. - The mysterious red light, which for two weeks has attracted thousands of persons to Deakin grove, northeast of here, has been solved. Fifteen thousand persons who had traveled miles to see it last night learned that instead of a "ghost" it came from a lantern carried by Sammie Busick, 13, while hunting worms. Various theories were advanced, to account for the nightly reappearance of the light. The crowds increased until the lonely hotel was unable to accommodate them. Examination of the soil by a chemist brought his announcement that the red glow was caused by phosphorous rising from the ground and coming in contact with light rays through which it passed. Busick admitted that he carried a red lantern in hunting night crawlers from the sale of which at $1 a gallon he hoped to purchase a roadster. When talk started about the "spooks" Sammie said he kept quiet fearing he would lose his business and prospective automobile. America being a big country, we consider it incumbent on us to do things on a big scale, and our latest project is certainly ambitious enough. Prof. Goddard, who has been experimenting for some years, and has perfected rockets which soar to amazing heights, is now going to turn his artillery on the moon. He believes that he can devise a firing apparatus which will give his rocket the muzzle velocity necessary to overcome the pull of the earth's gravitation. After that, by successive explosions en route, the rocket will, it is hoped, develop sufficient power to reach the moon, when the impact, the rocket being provided with a charge of flash powder, should produce a flare visible by the aid of an ordinary astronomical telescope. After thus shooting the moon, the professor is to turn his attention to Mars. But if, as certain people believe, Mars is inhabited, its citizens are hardly likely to relish this means of interplanetary communication, and may reply in kind, in which case even the league of nations will find difficulty in securing arbitration between the two parties to the argument. One prominent astronomical authority has allowed his imagination to play with the possible effect of gravity on the appearance of the Martians. His vision is interesting, and it fits the problem presented by such a huge engineering feat as represented by the canals. It is known that gravity on Mars is only one-third of what it is on the earth. That means that three times as much work could be done (as for example, the digging of a canal) by the same expenditure of muscular effort. With ourselves the average size of men conforms with the most efficient activity in our gravity. If the same were true on Mars, nature would build her Martians three times the size of men. Such a being would have three dimensions, height, breadth and thickness: therefore, on earth, he would weigh twenty-seven times as much as the average man, but on Mars, where gravity is only one-third of that of the earth, he would weigh nine times as much as we weigh in our sphere.